During sleep, our perception of the environment decreases. 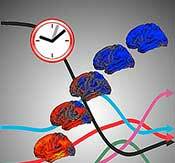 However the extent to which the human brain responds to surrounding noises during sleep remains unclear. In a study published this week in Proceedings of the National Academy of Sciences (PNAS), researchers from University of Liège (Belgium) used brain imaging to study responses to sounds during sleep. In this study, the research team led by Dr Thanh Dang-Vu and Prof. Pierre Maquet (Cyclotron Research Center, University of Liège) shows that brain activity induced by sounds during sleep closely depends on brain waves that constitute our sleep. They show that brain activity in the face of noise is controlled by specific brain waves during sleep. In particular, waves called sleep ‘spindles’ prevent the transmission of sounds to auditory brain regions. Conversely, when sounds are associated with brain waves called ‘K-complexes’, activation of auditory areas is larger. Our perception of the environment is therefore not continuously reduced during sleep, but rather varies throughout sleep under the influence of particular brain waves. By using functional magnetic resonance imaging (fMRI) combined with electroencephalography (EEG), researchers have evidenced that auditory brain regions remain active in response to sounds during sleep [see image, left panels], except when sounds occur during brain waves called sleep ‘spindles’. The study indeed shows that spindles prevent the transmission of sounds to the auditory cortex [see image, right panels]. Conversely, sounds can induce the production during sleep of brain waves called ‘K-complexes’. The results brought by this new study demonstrate that production of K-complexes by sounds is associated with a larger activation of auditory brain areas. While spindles prevent the transmission of sounds, K-complexes reflect a more important transmission of sounds to the sleeping brain. The effects of noise on sleep are therefore controlled by specific brain waves. In particular, the human brain is isolated from the environment during sleep spindles, which might allow essential sleep functions to operate such as the consolidation of memory for previously acquired information. These brain waves thus play a crucial role in sleep quality and stability in the face of noise. Material adapted from University of Liège. “Interplay between spontaneous and induced brain activity during human non-rapid eye movement sleep”, PNAS, 2011, doi 10.1073, by T.T. Dang-Vu, M. Bonjean, M. Schabus, M. Boly, A. Darsaud, M. Desseilles, C. Degueldre, E. Balteau, C. Phillips, A. Luxen, T. Sejnowski et P. Maquet.